LOUIS HYMAN: Well, good evening, everyone. Thank you so much for joining us, this our event this evening. 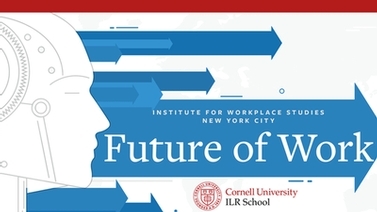 This is Cornell's Future of Work series. 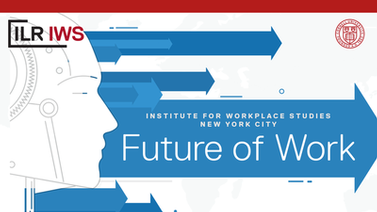 And I am Professor Louis Hyman, Director of the Institute for Workplace Studies here in New York City, which is the home for Cornell's research on the future of work. Over the next few years, Cornell is expanding in New York City, so as to better engage with this new economy, providing insights on how our workplace will unfold and how to navigate it. 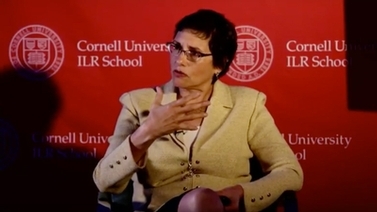 We're at the ILR school-- the school of labor and management relations at Cornell-- is especially interested in this because, of course, the issues with this new economy-- the issues with companies like Uber-- after all, are not about the convenience of the app or even the engineering behind the app, but what it means for our society, our economy, and, of course, for our work lives. Which is why I am honored to host our guest Susan Lund this evening. Susan Lund is a partner at the leading management consultancy McKinsey and Company, which has a research arm-- the McKinsey Global Institute-- where she leads research and advises clients on global financial markets, economic growth, and labor markets. She received her PhD in economics from Stanford, which I'm told is a reputable university somewhere on the west coast. Last year, Susan and her team released a report that we have with us tonight, based on original survey data and analysis, on the independent workforce, which made a big splash because it was the first publication to really look across different countries at how people were engaging in this new kind of work. It asked great questions, and it found some very surprising results. And so tonight, she's going to briefly share this report with us, help us better understand the present and hopefully the future of independent work. So Susan, thank you so much. SUSAN LUND: Thank you all very much. I'm going to share with you some of the highlights of a report-- it was sitting out in the other room, it Looks like this-- for those of you who are interested. As you can see, it's quite a tome. Very rare in this day and age. But I'm going to go through very quickly what some of the findings are. And then we're going to have a discussion between Louis and myself and then open it up for questions from all of you. So what are we talking about, and why are we even talking about it? Independent work is not new. This chart shows you from 1900 to 2015 the share of people who were self-employed in the US, Germany, and France. And what you see is that it was roughly half of the workforce 100 years ago. And then with the rise of factories and manufacturing, Henry Ford's assembly line, people moved into this-- what we now call traditional jobs, where you needed somebody at the assembly line for a certain number of hours at a given time. And so people moved into this payroll employment. And self-employed-- the share of self-employed people has fallen steadily. However, we think that there are reasons to believe we're at a turning point, and that this way of organizing work into payroll positions with set shifts at set places was an outcome of the Industrial Revolution. But now in the digital era, there are different ways of organizing work. So right now, on one hand, you have a lot of automation substituting for the manufacturing labor. You have new digital platforms like Uber or Upwork that enable people to find work independently. You have worker preferences that I'm going to tell you about. And you've got other factors driving what we think is going to be a different way of organizing labor going forward. So as Louis mentioned, we did our own survey. Government statistics measure payroll employment in great detail. They really ignore what this is-- what they often call the contingent workforce. That's true in the US. The Bureau of Labor Statistics last did a survey on how big the contingent workforce was in 2005. Sadly, they stopped just when it was taking off. And in Europe, similarly. So we commissioned our own survey of the US and five European countries-- the UK, France, Germany, Spain, and Sweden. We were interested in comparing across the Atlantic and seeing how big independent work was. What we found with our survey is that first of all, it's much bigger than people thought. So in the US, we think it's up to 27% of working-age people. That is 68 million people are engaging in independent work today. And then what surprised us actually quite a lot is that the figures in Europe look quite similar. That there, it's at 28% of the labor force, and in the EU, 15%. That equates to 62 million people are engaged. So who are these people, and what are they doing? First, it's important for me to define for you what we're calling independent work. We're using a very broad term. You might think-- we're basically looking at anybody who's earning money outside of an ongoing, traditional, long-term relationship with one employer. These people might call themselves freelancers. They might call themselves self-employed, independent contractors. But basically, we're looking-- we asked people all the different ways they made money over the last year. And then we classified them. So people who had these short-term contracts for less than a year, multiple employers, had flexibility in choosing, yes, I'm going to do this assignment, or no, I'm not, we called independent workers. Now, the vast majority of them are doing some sort of labor services. This could be a massage therapist, a personal trainer, an accountant. It could be an Uber driver, somebody cleaning houses through Upwork. Then you've got smaller pools of people selling goods. This could be people selling on eBay. And we can go into the details of how we sorted out people like my teenage children, who are selling old toys on eBay. And people selling on Etsy. And then a smaller pool still leasing assets. So that would be Airbnb rental or somebody who is leasing their car out on Getaround. And then you'll see that those circles overlap because one of the interesting things we found is that when somebody is doing one form of independent work, they're often putting together multiple different ways of earning income streams. But still, by far and away, the very largest portion of this is people doing some sort of labor service. So let-- the one point to make-- oh, my-- is this getting too loud? Sorry. [INAUDIBLE] How about-- all right. You can-- I'll let you do this, and I'll keep talking. So one of the key points to make, we found, first, is that more than half the people doing independent work are doing it for supplemental reasons. So that means that they may be retired, or a student, or a caregiver, and they're doing this just to supplement their household income. They may even have a traditional job, and they're-- for instance, a school teacher who's doing tutoring on the side. So that's over half of this entire population of independent workers. And it looks pretty similar in the US and Europe. The next thing we were interested in is why are people doing this? Is this just a sign of a bad labor market and people can't find a traditional job and so they're turning to freelancing? And what we found, quite surprisingly, is a resounding no, not for the most part. So 72% of the independent workers in the US say that they're doing this and this is their preferred way of working. 28% say they actually want a traditional job couldn't find one. In Europe, it's actually remarkably similar. The figures are a little bit more skewed towards people doing it out of necessity, and that's due solely to Spain. Spain had a very deep recession that it's still climbing out of extremely high unemployment. So Spain skews more towards people saying they can't find any other job, although it's still less than half of the total. When you look at Germany, the UK, and Sweden, the figures are up in the range of the US or even higher. And then France sort of sits somewhere in the middle. But the majority of people are doing this by choice. So even as economies improve and growth picks up, we would not expect this to go away or shrink in any way. So when you put all of this together, we identify four different pools of independent workers. And the largest group in both the US and Europe is what we call the casual earners. So these are people who choose to do some type of gig work to supplement their income. The second largest group in both cases is what we call the free agents. Those are the people doing this as their primary source of household income on a full-time basis, and they're doing it by choice. And then we've got two groups working out of necessity. Either the reluctants, who are doing it full time because they say they can't find a job, or the financially strapped people who may have a full-time job, but they're not earning enough, and so they're supplementing their income. Now, we were curious about, how do independent workers view their work lives? So we already know that they're doing this by choice. We asked 14 different points of different elements of your work life, and asked both traditional workers and independent workers to rate how satisfied they were. And what you see is that the independent workers are more satisfied on 12 of the 14 measures-- the people working by choice-- and have the same level of satisfaction that's not statistically different on two. And the interesting thing to me is looking at the variety of things that people say they're happy about. It's not just flexible hours-- which would be obvious-- independence in choosing where to work and when to work. It's things like I have more creativity. I think I have faster opportunities for career advancement. And that's true mostly for the people working by choice. Those working by necessity are happier than people in traditional jobs on many elements of flexibility. But then they're noticeably less happy on things like income level and income security, which makes sense. So when you look at this, it actually has important implications, I think, for companies and large corporations, as they think about what do people value in work, and how can we redesign the way we're working in traditional jobs to try to mimic some of what people are getting out of independent work? Independent work spans across all demographics. This is not a millennial thing. We see that the participation rate is high among people under age 25. 56% of people earning money under the age of 25 is doing it through independent work. But you see it's almost the same in seniors-- people over 65. The participation rate goes down a little bit in the sort of middle income-- middle age earning years. But it's very high among young people and retirees. You see that women participate nearly as much as men. You have low-income households, high-income households. This is actually a very broad-based phenomenon. When you look at the industries that people are working in, it's similarly very broad-based. It's not just Uber and transportation. It's business services. It's education, health care, all types of occupations and sectors. Now we get to what people often think of as the gig economy. It's people who use a digital platform like Uber or Lyft to find jobs. It's striking, of all independent workers, only 15% currently have ever used a digital platform to find customers. And when you look at who those people are, you see people providing labor, it's even lower. Only 6% have ever used a platform. But 2/3 of people selling goods do it through online. And that makes sense, because e-commerce, of course, has been around for 20 years. It's a maturing business. So if you're going to be selling your handicrafts, rather than simply going to the farmer's market or art fairs, you're likely to set up a website and do it online. And then for people who lease assets, it's about 1/3 right now. So these digital platforms are very much in their infancy. They're growing rapidly. They're proliferating. Every time I open up my email box, I have an email from another type of platform wanting to tell me about their business model. It's an exciting time. But right now, you have to remember that it's very small. And this is consistent with other research, for instance, by the JPMorgan Chase Institute, that estimates only 3% to 4% of Americans have ever found work through one of these gig platforms. But the gig platforms, I think, are quite important because when you look at the people who use a digital platform, they're more likely to be in that free agent bucket. So the platform enables them to get enough business to make this their full-time primary source of income, not just a way to supplement. No, I think it's going to get bigger. How much bigger? I don't know. I'm not forecasting. But there are two reasons I think it's going to be bigger. The first is that there are 20 million Americans right now, and actually 80 million people in the EU who say they want to work more. So these are people who tell government labor organizations that they're working part time when they want full-time work. They're discouraged. They've dropped out of the labor force. Or they're inactive, but they'd like to work. So independent work offers the flexibility and the ability to work when you want, where you want and is a good way for some of these people maybe to get in some hours of work. And the second reason I think it's going to grow is because we asked people in traditional jobs and independent work what they were likely to do in the future. And if you take just the people who say they're very likely or likely to try independent work, what you see is that these numbers could easily double. If you let the independent workers who want a traditional job get one and then you took people who are supplementing their income who want to go full time, et cetera, you end up basically with a doubling of the numbers. Now, do I think that's going to happen? Well, not necessarily. But I think that the indication is that if anything, this is a growing trend. And when you step back and think about the history of work, it makes sense. So already, we've gone from having one unionized job at an employer for life to people realizing they're going to have multiple employers, maybe multiple careers, working flexibly, I think independently is just the next step. It's similar to what I hear often working with companies. Now, for many years, they've said, you know, people won't move for their job anymore. When we offer someone a promotion if they move to Pittsburgh, they'll say no. And this is shocking. But I think that the whole relationship between employer and employee in many different ways has been shifting towards more of an arm-length, transactional type of mode. And in that world, then just being your own boss actually is the next step that makes sense. So there's lots that needs to happen to make this all work better. I mean, policymakers we need to de-link health care, and retirement, and unemployment benefits, disability benefits from an employer. Organizations-- companies need to rethink their boundaries-- how can they actually get talent exactly when it's needed? And how can digital tools enable them to actually create more of an internal labor market? There's lots of innovation going on. I just walked by a WeWork down the street. So there's all sorts of businesses needed to help independent workers do their job, whether it's renting them physical space, doing back office accounting and tax filing, creating communities. And then finally, people themselves are going to have to view their career and the way they earn a living very differently than they had in the past. And this is thinking about yourself-- Reid Hoffman wrote a book called The Start-Up of You. And that mindset, I think, is absolutely critical, as is thinking about what is going to be your value added in the workplace? And how do you get differentiated skills that enable you to command a premium and get a steady stream of work? So these are just some of the ideas. And now, I think we're going to continue with the conversation. So thank you. [APPLAUSE] LOUIS HYMAN: I mean, I think that data is just so counter-intuitive, that we are told that this is just-- this is just about Uber. This is just about a few people doing it. And yet it's a huge chunk of the workforce. But that-- I mean, that in and of itself is surprising to me. But beyond that, there is this tremendous convergence between Europe and the United States that these are all very different economies. Right? And if you talk to people about, well, why are people doing this in the US? They say things like, oh, it's just employers avoiding benefits. SUSAN LUND: Yeah. LOUIS HYMAN: Oh, it's very different kind-- or people in France, oh, it's because of the labor laws here. You know, if you're in Sweden, you get benefits either way. And yet, Sweden looks the same as the US. And so how do you guys think about this broad convergence across many different countries? SUSAN LUND: Well, let me tell you that we were surprised at first by the results in Europe as well. So in the US, on one hand, you do hear about the fissured workforce-- employers outsourcing the janitors and the cafeteria workers-- which, by the way, largely are not-- we would not count as independent workers. They're just employees of a subcontracting company. So that's a totally different phenomenon. Or among-- on the positive side, you hear, well Americans are entrepreneurial. We like to go it alone. We do have the highest rate of innovation and start-ups. So maybe it's this American thing. In Europe, it's not. So in Sweden, it actually has the highest rate and the most people doing it out of choice. And maybe it's because they get health care and education benefits no matter how they work. Right? And in even in Germany, which you again think of as people very traditional. Same picture as the US in terms of the rate of participation and their choice in doing it. So I think that one of the things that's happening is-- and in Europe, I think they actually make it easier for folks because they haven't developed this system where health insurance and retirement benefits are tied to an employer. They're coming more from the government. So you can work however you want to work. And I think it's an artifact of the digital age. I think that we no longer need to be at our assembly line station, doing our-- hammering our nail for eight hours, and then somebody else comes and replaces us, right? I mean, I am not an independent worker. I'm a wage slave. But I have my laptop. I work on the go. I work in the taxi. I work from home. I work from a client. I mean, I'm not tied to a desk. Like, this step between the way I work and then just being my own boss entirely is actually a pretty small step. And I that's happening for a lot of people. LOUIS HYMAN: Don't worry, we won't tell your bosses you said that. SUSAN LUND: They'd probably be happy. [LAUGHTER] LOUIS HYMAN: But I mean, I think one of the things that critics point to in all this is that it's just a race to the bottom. It's just about-- with this kind of flexible access to all these different workers that wages will fall, wages will fall. I mean, what-- how do you respond to that kind of criticism? It seems one of the things you pointed to a differentiated work. But it also seems like you could have this global demand. So where does supply-- you're an economist. SUSAN LUND: Where does supply and demand-- oh, wages are a tough one. And we didn't-- the survey data-- it's very hard to get people to tell you accurately what their income is. And so we, by and large, didn't try. So we don't know about the wages. We know about the household income of people in our sample. And they're-- like I said, there was a distribution that was really not different between people with traditional jobs and independent work. High-income people, middle-income people, low-income people. What are the hourly earnings are, we don't know. The academic literature on this is mixed. So on one hand, you would expect that people with a lot of skills actually are doing better in this new world because there's a lot of demand for their services and so they can bid up their wages. If you are a generic low-skill worker, now you've got more competition. Anyone can go clean out my garage, or, you know, mow a lawn. So that said, though, some work-- a good study out of Columbia University actually found that these online platforms help low-wage workers as well because one of the things you can do is you don't just have to be Joe who can clean the garage. You can show, oh, I have a 4.5 star rating on customer satisfaction. And I'm always there on time. And I-- you know, it's actually because these online profiles are very rich, you can actually showcase more of your talents in a way to differentiate yourself. So I think the jury's out on whether this is good for wages or bad for wages. One of the things you'll note in our survey-- people said they were-- independent workers said they were happier than traditional workers with income security, which I found really interesting. They felt like their income is more secure than someone with a traditional job. LOUIS HYMAN: Because they could-- you can be fired at any time. But there's a sense there's multiple-- SUSAN LUND: That's right. But once you've cracked the nut on being your own boss and being an independent worker, you know you're not going to be fired. LOUIS HYMAN: Well, I'm just an American cowboy, so I'm just going into this, but-- you know, it seems like one of the things that is interesting to think about is not just how it's transforming work outside of the traditional corporation, but transforming work inside corporation. I mean, how do you talk to chief HR officers as they sort of rethink about retaining talent who could easily move into this other kind of space? And for all these young workers, they've had this experience outside of the firm. So it's hard-- once you have that kind of freedom, how do you sit at a desk all day? SUSAN LUND: Yeah. I think-- well, I think companies have not even really begun to seriously think about this. Most HR departments are still in the mindset, we're trying to find a candidate who's going to stay with us full-time for 10 years. It's like, that's not even the way the world works. Nobody wants that anymore. So I think that companies have not begun to fully think through how to work this. Now, there are exceptions. Silicon Valley is filled with large companies that have got loads of independent contractors. And there are large corporations that have a lot of 1099 contractors on their books right now. So there are some companies who understand that you can get people when you want it, when you want them, and it's more flexible. But I think for the vast majority of US companies, they haven't really thought through, wow, how could we think differently about how we organize work as a result of this? LOUIS HYMAN: So interesting. Well, should we take some questions from the audience? SUSAN LUND: Absolutely. LOUIS HYMAN: OK. AUDIENCE: Hi. Can you talk a little bit about variation in sample size for each country and then possibly touch upon shortcomings of this study? SUSAN LUND: Sure. So the sample size was, I think, 2,000-- rough-- around 2,000 respondents per country. So it's small, but it's large enough to be statistically representative in terms of age, gender, I think geography. It was not representative of educational levels. As it turns out, our sample is slightly more highly educated than the general population. I would say the biggest shortcoming is that it was an internet-based survey. So we know that you would be under-sampling people with lower levels of education, probably poorer households, maybe rural households. So it's very expensive to do in-person surveys, especially across six countries. So that's an obvious caveat. I would say-- so, doing it again, I would-- well, if, say, budget weren't an issue, I would increase the sample size. I would control for education, which would force you to increase the sample size. And frankly, I would have asked more people of the people-- more questions of the people who said they were doing this out of necessity. So when people said they preferred a traditional job but were doing this, I now wish we would have said, well, you know, the unemployment rate is 4.8%. We did this last summer, but still, it was 5.5%. So why don't you have a traditional job? Is it that you don't like the traditional job you can get? Were the wages worse? Could you not accommodate the hours because maybe you didn't have childcare, or you couldn't get the transportation to the job? But I'd love to know more about why people didn't have a traditional job and were doing this even when they said they preferred to have one. AUDIENCE: Could you-- I'm quite close to the German numbers. I know those quite well, and yours differ so drastically. They show a totally different picture. So I wonder how-- can you just explain-- or, I just want to try to understand how you arrived at those numbers. I mean, you mentioned some of that, but maybe go-- could you go a bit more in detail? SUSAN LUND: Yeah. So I think the reason that the numbers in Europe are so different than the government statistics is that government statistics just look at the primary way people earn income. And we're including people who may have a traditional job but they're doing this on the side. So that explains the huge gap. In the US, that's also how the government-- they only look at your primary source of income. But we have other surveys-- like the Upwork freelancer union survey. LOUIS HYMAN: That we talked about in the fall, and is available on our website. SUSAN LUND: That you talked about in the fall. So we actually-- there are other private surveys in the US that had gotten at this broader definition. And we didn't find any of those in Europe. So in Europe, it's purely people's primary way of working. And then when you compare the numbers of the primary way of working, they're actually quite similar. So instead of 28%, it's roughly half that, so it's 13% or 14% are in the independent workforce by our definition, which is then not so far off of the self-employed plus temporary workers in Germany. LOUIS HYMAN: I think, more generally, that's why it's so easy to be shocked by these numbers because of the way in which-- the certain way we collect statistics about work. The categories we used are based on another economy, and they don't-- haven't been opened or redefined to the way people are actually working today. That's what's exciting about these kinds of independent studies. 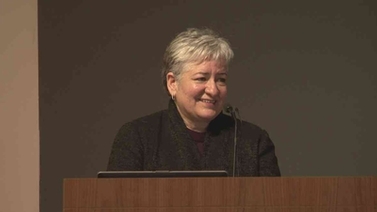 And until we get the BLS contingent survey later this year-- SUSAN LUND: Yeah. LOUIS HYMAN: --it'll be harder to-- SUSAN LUND: Well, which itself is incredibly flawed and actually only covers primary income. And I mean, there's still very much a mindset in government-- and among across society-- that a job is a payroll job. And I think what our numbers show is, even if you have a payroll job, you're doing all sorts of other things to make money on the side. LOUIS HYMAN: Yeah and I think that, certainly from my perspective, what I'm seeing in data and things I'm looking at now is that we're putting together jobs in new ways. The way we put together a portfolio of asset investment, we put together a portfolio of work. SUSAN LUND: Yes. Exactly. AUDIENCE: Can you guys repeat the questions for the online audience, please? LOUIS HYMAN: Sure. SUSAN LUND: Yes. Sorry. You can be the chooser. LOUIS HYMAN: Yes, please. AUDIENCE: Yeah. I'm a labor activist, so I see this very different from my experience-- well, personally and with the workers I work with. So first of all, I think the independent worker, I would consider it [? various ?] work and I would include subcontractees because most of them are not working full-time jobs. They don't have any stability. The other thing is I think that-- my experience is that the lower wage workers that were not able to be gotten in your study, both because it was online and in English, are often doing multiple jobs-- not because they want to, because they have no choice. They're making sub-minimum wage. Restaurant workers that I work with in the [INAUDIBLE] center make sub-minimum wage. And they have to work other jobs. It's not a choice for them. They would be very thrilled with a full-time job with benefits. And I think that this is a very good situation for companies and for employers. Particularly in the US, as you said, we're not anywhere near having guaranteed health care, guaranteed education, any of that stuff that they have in Europe. And even in Europe, that's under attack, the full-time wage. So I think-- I think we have to look at-- so one for low-wage workers. And then, even for non low-wage workers-- so people that graduate with PhDs, like my husband, who got a PhD from NYU-- also, reputedly, a decent school. You know, he's working part-time temporary jobs. A lot of people are working as adjuncts, making $27,000 a year with a PhD from a good University. And I guarantee none of them don't want a full time job. So I think for people that are high-skill, or artists, who really want to do that, that's great. But I think, from the perspective of the working class, we have to look at it that this is being driven out of just-in-time financing, desire to get rid of benefits, a desire to lower the wages. And I think if we don't with it from the worker's perspective-- you know, I should say Uber workers too. We're getting screwed. They were brought on saying they were going to make a certain amount, now their wages are being driven down. And they're driving down the wages of taxi workers, who, before, were making a decent living. So it's really a lose-lose scenario. And I understand that you're working with-- you're primarily serving employers, which is fine. But I think from the perspective of the labor movement, this is something that we have to deal with-- we have to fight politically. And we have to say, if you want to work in the gig economy or as a self-employed independent worker, that's fine. But workers should have a right to a job with a living wage that meets their needs. You shouldn't have to be your own business person and search out jobs. And the other thing I have to say is people who work cleaning out your garage or doing all your lawns are not unskilled workers. Not everyone-- I can't mow a lawn and do landscaping. So every job has dignity. Every job has skill And if we make that kind of connection, we're just raising the inequality. And I think that's really problematic. I have to say, I'm very emotional about this because it affects my family and all the workers I work with. 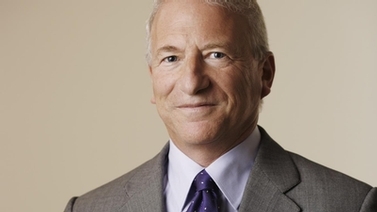 LOUIS HYMAN: I can't eloquently recount that for the online audience. But the audience member pointed to how this is actually a very different experience for low-wage workers and questioned whether or not what the status was for-- just tell me if I'm making-- that this freedom looks like precarity for those who would prefer to have security. And-- AUDIENCE: [INAUDIBLE] living wage because they could depend on without having to run-- LOUIS HYMAN: Not everybody wants to be an entrepreneur. People just want to have a job and make enough in that job and-- AUDIENCE: Take care of their families. LOUIS HYMAN: Take care of their families. So-- SUSAN LUND: I don't disagree I mean, I think this was a split between the people saying they're doing it out of necessity, I think, are the people you're talking about. One thing I do want to clarify, though, is-- I'm from the McKinsey Global Institute. We're not doing this work for companies. We're completely funded just by the firm. And we do that because we want to be able to be objective and report our findings. So we didn't have any preconceived notion of what we're finding. But I do think you're pointing out, look there's the 28% of this group who say they want a traditional job and they can't find one. And the people making-- doing multiple jobs, I think, are what we call the financially strapped. The people saying, even if I have a traditional job, if it's minimum wage, in many states, I need to go out and supplement my income. And I don't think that we should overlook that at all. I think that there are issues around the minimum wage, which is now being raised in many states. And, you know, the Affordable Care Act, which was one step in the direction of enabling everyone, regardless of employer, to get access to health insurance in this country are very important steps. And I would agree that being an entrepreneur is not for everyone, including the two of us sitting here. LOUIS HYMAN: Yeah. I'm not an entrepreneur at all. [LAUGHTER] I tried to cut lawns when I was a kid. Didn't work out that well. SUSAN LUND: I've worked at the same company for 20 years. LOUIS HYMAN: But I think it's important to realize that there's divergent experiences in here. And I think the data reflects that. I think what's surprising for some people who imagine that everybody wants to be entrepreneur-- they're stunned when somebody doesn't like it. SUSAN LUND: Right. When you say 28% don't want this. LOUIS HYMAN: And then, conversely, when people who experience their world as precarious and, you know, uncertain, they could be shocked that anyone-- I think it's the same way in which there can be a diversity of experiences under traditional employer capitalism, right? That we shouldn't, in that process, romanticize that everybody had a wonderful experience working a GE. SUSAN LUND: And let me just say-- OK. I'm an economist. So there is a broader trend here that has nothing to do with independent work versus payroll job, because trust me, many, many people with a payroll job feel their lives are precarious, that there's layoffs. They could be fired. They could be let go for this or that. I mean, that's certainly not security. And there is a broader trend-- two trends that are worth pointing out. One is that the labor share of national income has declined quite a lot over the last two decades. There used to be sort of an economic law that about 2/3 of national income went to labor and 1/3 to capital. Well, that share started declining dramatically after 1980, and nobody's quite sure why. It's coincided with a number of different changes in the US labor market- the decline of unions, shift from manufacturing to service jobs, some other trends. But that certainly goes to the fact that-- and the other fact is simply that the median household income has been stagnant in the United States for several decades and for some subsets has actually declined. So for, you know-- so there are broader tensions about precariousness and people feeling like they have to do multiple jobs because they're not earning a living wage that I think are broader than the independent work phenomenon. LOUIS HYMAN: An excellent question, though. Yeah. AUDIENCE: Yeah. Thanks for the presentation. I was wondering about the choice between choice and necessity-- whether that, in many cases is not more like a continuum than, you know, like a binary because in the German example, there are many jobs which I assume fall under this category. Many people do this as a supplementary income. Yeah, of course, people get by. So they not necessarily do this out of necessity. But it's supplementary, so don't those people-- wouldn't they, psychologically, possibly say rather they do this out of choice than admitting that they're actually doing this out of necessity? This if I do this out of choice, am I not disposed to be more happy about it than rather to admit that I'm actually unhappy about it? So this is sort of like a question for methodology. LOUIS HYMAN: Just to repeat the question again for our online audience. Are people having a false consciousness about whether or not this is choice or necessity? Are they actually experiencing this necessity as choice, and it makes them feel empowered to their own feelings of agency in this world? I think also it speaks to a larger question of, maybe they start off at-- another inverse of that would be do they start off out of necessity and then, oh, experience this world of choice? And sort of how did we-- how did you-- how did McKinsey sort of think through these pair-- I'm sure you guys had many a conversation over this. And how did that binary come about? SUSAN LUND: We had many a conversation over choice versus necessity. And we did our best. So on one hand, you can say, everybody's working out of choice. Right? There is not slave labor. So if you're doing this, you have chosen to do it. On the other hand, you can say, everybody's working out of necessity. I work because I need an income. As much as I may like my job, the truth is, we all work out of necessity. These are crude words. We were simply trying to capture the point that the previous question raised. Are people-- there are a subset of people who say, I love this. I-- you couldn't pay me enough to go take a desk job. And there are people who are saying, no, I would really like a full-time job with benefits, and I can't find one sometimes. So it's crude. It's highly imperfect. In Germany, in particular, the mini jobs-- are people saying they're doing it out of choice when, in fact, it's necessity? It's an interesting question. So for those of you who don't know the German labor market, they have a program called Mini Jobs that have limited numbers of hours that you can work. But I think employers are subsidized to provide these jobs. So if you're out of work, you can go get a mini job and earn a little bit of money. I mean I don't know. You'd have to tell me, are-- I would imagine, though, a lot of people doing the mini jobs actually don't want to work any more than that. I mean, Germany's unemployment rate is like 3% or 2.5% percent right now. I mean, they have a tight labor market. So I don't know. I mean, it's interesting. And I think it's an interesting point-- there was somebody I was talking to in the audience-- and if want to stand up and relate their story, they can-- but who said that they started freelancing, writing between full-time jobs. And then it turns out, they couldn't find a full-time job. It didn't come through. So they were freelancing and freelancing. But then they started to realize, well, this isn't so bad, that maybe I actually sort of like this. So I think that how we interact with work actually does shift over time. And I think it's complex. And we've done our best to try to distinguish this phenomenon. But it's highly imperfect, for sure. LOUIS HYMAN: Can I take a question for-- I'm being blinded by the light a little bit. Yeah, can I-- yes ma'am? AUDIENCE: Oh, thanks. I am curious about whether your research revealed any gender differences in some of these choices or the types of gigs that have been created as a result of these new trends. So for example, if you think about home health aids in the US, you know, overwhelmingly women. You know, et cetera. So that got me thinking about this ongoing worry that, you know, women in the US, on average, are still earning $.70 to the $1 of every man-- or $1 that a man would earn. So is the gig economy actually perpetuating that, or even worsening that ration? LOUIS HYMAN: So the question from the audience was, is gender shaping the way the gig economy is playing out? Is it-- how is it affecting inequities-- gender equities and the wage gap? SUSAN LUND: So we saw some differences in how women are participating than men. Men are more likely to be in the free agent category-- so doing this full-time, by choice, they're self-employed, they're the boss. Women are disproportionately likely to be in the bottom right category-- the financially strapped people who say they want a full-time job with benefits but they're doing this to supplement their income to get by. That reflects the fact that women-- female headed households are disproportionately likely to be under the poverty line. And I think it's an interesting point, I don't know, about gender studies and sociology that men are disproportionately likely to be the free-- the risk taker doing this full-time. Now, whether for a given job women are paid less as an independent worker than a man and how that compares to the 70%, you know, wage-- or the 30% wage gap that you see in traditional employment, we just don't have information on. LOUIS HYMAN: OK I think we have time for one more question. I'm going to take it from the internet to encourage people from the internet to give us questions. One of the questions is, how does this affect people with disabilities? This sort of one of the interesting questions is, are people with disabilities more likely to find work in this sort of online gig economy, or the physical economy, or how does this intersect with disabilities in any way? Are people with disabilities-- you know, it seems like there would be an opportunity if you were home-bound or had sort of a physical impairment or other kinds of problems that you couldn't sort of work on a regular basis, [INAUDIBLE] opportunities. But also, is this a way in which-- this is one of the person [INAUDIBLE] was asking-- or are they indirectly forced to work as free agents by being barred from traditional employment by discrimination? SUSAN LUND: It's a great question. I can definitely see the upside. So somebody who has a hard time getting around or needs to work from home, this is a whole new way of working from home, finding work through, say, Upwork or freelancer.com. Of the things we saw in the survey is that if a respondent said that they were caring for an elderly or disabled person at home, 70% of them were working as independent workers. So I think the flexibility offered, if you do have either someone you're caring for are disabled yourself, is very attractive. So if you're earning money at all, you're disproportionately likely to be doing it through independent work, not a traditional job. So maybe it opens up opportunities. Now, whether-- I don't know what it means for, though-- you know, I think there are all sorts of problems that workplaces are supposed to be providing for access for people with disabilities to be able to work productively in an office setting or traditional work-- workforce. I don't know-- LOUIS HYMAN: But it's not always-- SUSAN LUND: --how well. LOUIS HYMAN: --not always reality. SUSAN LUND: It's not reality. LOUIS HYMAN: Well, Susan, thank you so much for this excellent conversation and for continuing this excellent line of inquiry. So provocative. Thank you. SUSAN LUND: Thank you. Thank you all. Great questions. [APPLAUSE] LOUIS HYMAN: And everyone, we're going to have some treats and wine. And online people, you get no treats and no wine. So come in person next time and enjoy the conversation. [MUSIC PLAYING] ANNOUNCER: This has been a production of the ILR school at Cornell University. According to recent analysis, 94% of all net new jobs in the past ten years are freelance, temp, part-time, or gig labor. The story of this change--as a choice or as a necessity--appear to be mutually exclusive. Critics see this shift as the death of the good job, while proponents see this as liberation from the 9-to-5. Susan Lund, economist and partner at McKinsey Global Institute, will complicate this good/evil story, drawing on new research that shows the divergent experiences of workers in the gig economy around the world, putting numbers to the narratives.